NAZISM AND HOLOCAUST NAZISMO Y HOLOCAUSTO: Giselle Perl, a murder or a saint? Giselle Perl, a murder or a saint? Gisella Perl was a successful Jewish gynaecologist in Sighet, Romania before the Second World War. She was best known for her innovative research into female reproduction. Over the course of her professional life she delivered thousands of babies, saved countless lives, and provided medical and emotional comfort to those in need. 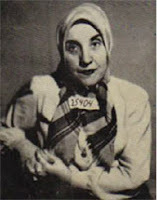 In 1944 she, along with almost all of Sighet's Jews, was transported to Auschwitz, where she was put to work in the infirmary. In the years since the war, her role as a physician in Auschwitz has led her work to be cast under ethical scrutiny: Perl has been simultaneously considered a murderer by some and a saint by others. This controversy largely revolves around her role as an abortionist within the camp. The following article explores her life before, during and after the war aiming to provide a balanced view of her struggles and accomplishments.